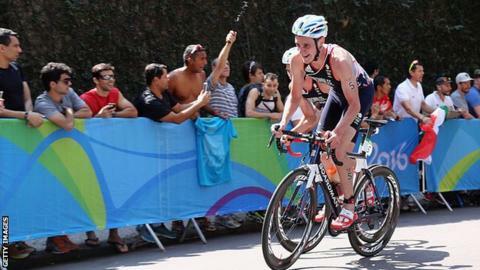 Double Olympic triathlon champion Alistair Brownlee is to take two years out from the sport to train for the World Ironman Championships in Hawaii. Brownlee, 28, won Olympic gold at London and Rio, and has not ruled out bidding for a third win at Tokyo 2020. "I'm going to pursue things away from Olympic triathlon; it's important I have a different focus," Brownlee said. "I've been to three Olympics and I can't say I won't definitely be at a fourth." Ironman triathlons consist of a 2.4-mile swim, a 112-mile cycle and a full marathon - almost four times further than an Olympic triathlon. "All triathletes have the ambition to do the almost mystical Ironman World Championships in Hawaii," added Brownlee, who beat his brother Jonny into second place at the Rio Games. "It's very unlikely that I could do it in the next two years, but I could build up my endurance then maybe go back to it after Tokyo as a 32-year-old." Brownlee has also revealed his mixed feelings over the attention that followed his decision to help his brother over the finish line at September's season-ending World Series event in Mexico. Leading with 700m left, Jonny, 26, began to weave over the road in hot and humid conditions in Cozumel. Third-placed Alistair caught his brother, propping him up for the final couple of hundred metres before pushing him over the line in second place. "Both Jonny and I were really quite uncomfortable with the attention that came out of that day, especially while Jonny was in intensive care and the jury were deliberating on whether we should be disqualified," he said. "The scale of the after-effect was incredible and, to be honest, completely baffling. We were both embarrassed at first and wanted to turn down all the attention, but we realised it gave us a platform to talk about triathlon and encourage people to get active. "The whole Mexico thing brought us to the attention of a lot of people who probably didn't know what triathlon was. So I think now that we can look back on it with the benefit of hindsight, it was probably a good thing - although I'd still have preferred Jonny to have won the race."